Actually, this was one of those occasions when someone else (however unwittingly) pushes you into doing something you had put off for ages. 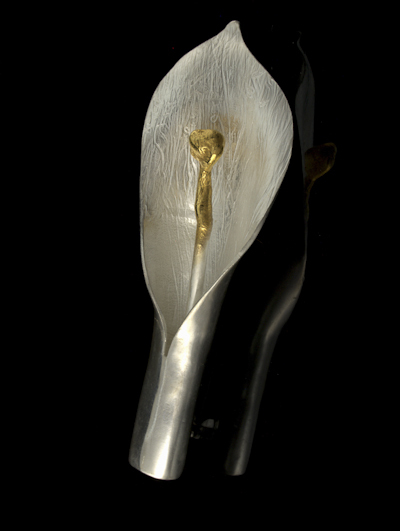 Silver arum lily with gold plated highlights. Made to give to a friend.. I'm gonna get letters. Yes, of course an arum lily is broader than that. 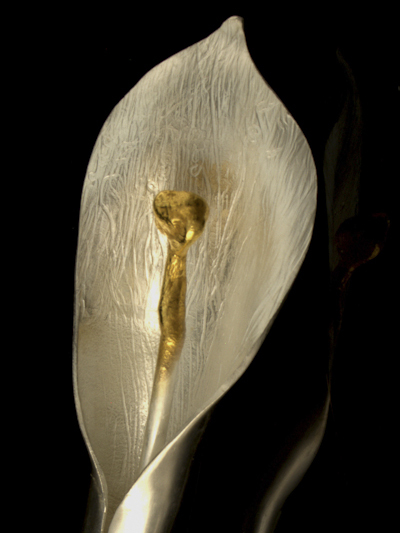 No, I know that the stamen aren't gold. Did I say I was a horticulture wiz? I'd been thinking about making something like this for a long time, and then a good friend mentioned that she had seen something along these lines that she had really, really liked (actually it's a much longer story, but we will leave it at that). Now, call me cynical, but it's odd that this little hint should have come up not long before her birthday, isn't it? Anyhow, I couldn't disappoint her, could I?